Up to 70,000 people attended a rally on March 1 commemorating slain politician and Kremlin critic Boris Nemtsov. The text on this poster reads, “I am not afraid”. 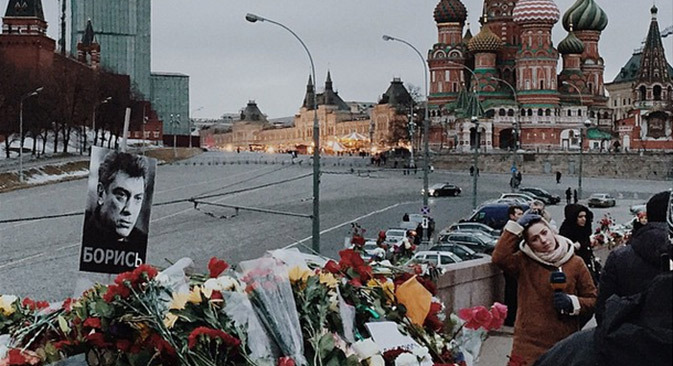 Thousands bidding farewell to murdered politician Nemtsov. On Friday, oppositionist Alexei Navalny was released from custody after 15 days, having been arrested for handing out leaflets calling for people to participate in an anti-crisis march on March 1. Here is Navalny’s latest Instagram, posted 2 weeks ago. In it, 2 police officers are leading Navalny to the court room. Russian President Vladimir Putin marked down his salary by 10 percent, signing a decree to lower the salary of the Russian president and prime minister for the period March 1 - December 31, 2015. March 8 is International Women’s Day — a day when (nearly) every man walking the streets of Russia’s towns and cities will be holding bright pastel-colored flowers and myriad chocolate boxes under his arm. Every man has some woman in his life who needs congratulating on this day, which is like Valentine’s Day and Mother’s Day combined, but more intense. On March 8, the entire country gets the day off to celebrate women. Moscow is the 167th most livable city in the world, according to a new poll. First place goes to Vienna, Austria.